We are very pleased to announce the third and penultimate event in the series of doctoral defences of The City as a Project Ph.D. candidates. Hamed Khosravi and Platon Issaias will defend their work against an opposition committee composed by: Michiel Riedijk, S. Umberto Barbieri (TU Delft, Promotors), Pier Vittorio Aureli (AA, co-promotor), Paola Viganò (IUAV), Tom Avermaete (TU Delft), Adrian Lahoud (Bartlett), Tala Vaziri (American University in Dubai) and Aristides Antonas (University of Thessaly). 23 May. 9:30 Presentation. 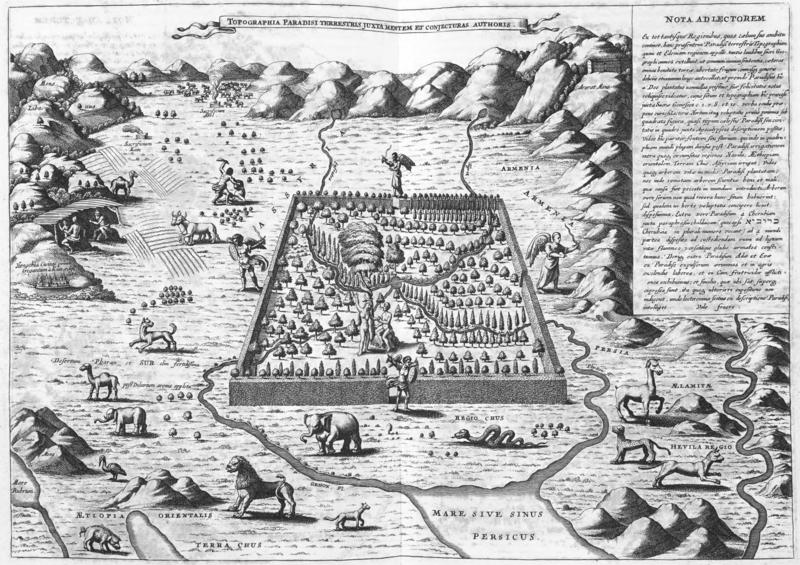 10.00 Defence Terrestrial Paradise, from Athanasius Kircher, Arca Noë (Amsterdam: J. Janssonium a Waesberge, 1675). The dissertation explores the political foundations of the city. It positions itself around a definition of the idea of the political, which is determined by the specific constitution of opposed entities; a dichotomy between a sovereign body and movements. Subsequently, the research suggests a dialectical reading of the idea of Urban Form, which is built upon the relation between norm and exception, between friendship and enmity, inclusion and exclusion. Departing from this definition, the dissertation stresses on the (constructive) dynamism of opposing forces which motivate or shape a creative tension: the state of antithetical, which becomes spatialised in the form of the city. This political understanding of the concept of the city has always been entangled with theological polemics. In this dissertation, the very notion of separation, that is embedded in theology, becomes the core concept when an ideological power aims at defining itself through the act of exclusion. Walls, enclosures and boundaries are the architectural elements that represent this action. However here the idea of separation does not imply a form of rejection but rather an association. Camp of Faith rereads these peculiar urban forms as political repercussions of theological ideas, when the city’s architecture establishes a relationship between power, inhabitants and territory. These spatial configurations mediate the moment of conflict, when opposing forces collide and projects are initiated in a dialectical process. Cities become laboratories of projects and counter-projects. Nevertheless the research’s ambition rests in the architectural quality of such phenomena, not only reading the architecture as an outcome of a deliberate political act but also when political ideas and ideologies emerge from the very architecture of the city. Camp of Faith relies on the close reading of paradigmatic examples that unfold the theological idea of city beyond the limits of time and geography. Therefore, here, the concern is not so much changing stylistic periods, but rather the issue of continuity; a specific conception of space which has remained constant despite the advent of technological and economic development: reading the city as series of inhabitable walls. 23 May. 12.00 Presentation. 12.30 Defence Vincenzo Castella, Athens 1998. The thesis attempts to discuss the “informal” urbanization that characterizes the contemporary Greek cities as an immediate derivative of a complex political project, displayed primarily by architectural and urban typologies and protocols. As a case study, the Greek cities and particularly Athens, offer a possible critique on the recent conceptions regarding the distinction between “informal” and “formal” urbanism. These two dialectically opposite categories wish to distinguish two types of planning, which supposedly represent equally opposing political processes in the establishment, the formation and the development of cities. Nevertheless, the argument of the thesis is that in the Greek case, what appears to be a spontaneous and un-planned urban typology is the result of a precise institutional and regulatory framework, a particular technology of governance and administration. The consecutive failures or absence of conventional planning mechanisms, like zoning regulations, or the lack of large scale planning proposals, marked what could be seen as a gradual retreat of public institutions from a comprehensive project for the city. Instead, the state and its administrative authorities produced a legislative frame, consisting of complex laws and decrees of various exceptions and particularities, which addressed instant and immediate issues. These were meant to control the small scale of the urban environment, i.e. the architecture and the building construction rather than the physical and urban form of the city in a larger scale, eventually promoting and formulating distinctive building practices. These practices established a condition of uneven development within the urban territories of the country, where the smallest scale of the city, the housing unit itself, built and formed the city with an apparently accidental and fragmented pattern. Most importantly, the small-scale construction industry was gradually conceived and institutionalized as the motor of capitalist development, becoming eventually the platform upon which class struggle, and the aftermaths of the various conflicts, social desires and antagonisms could be read. The ambition of the thesis is to trace the evolution of this pattern of urban development, within various historic events and political decisions. Ultimately, the research addresses the latter in an effort to discuss how the promoted architectural objects and machineries replaced conventional planning as devices of bio-political control and management of city and its population. The thesis focuses on the characteristics of this peculiar architecture, as this evolved strategically through time. The originally urban and bourgeois “polykatoikia” residential type and the self-building practices for both the high classes and the poor represented initially alternative methods to fulfill the housing needs of different social subjects. Eventually, these two systems merged and established a common architectural language, a unified and unifying building knowledge and technique. 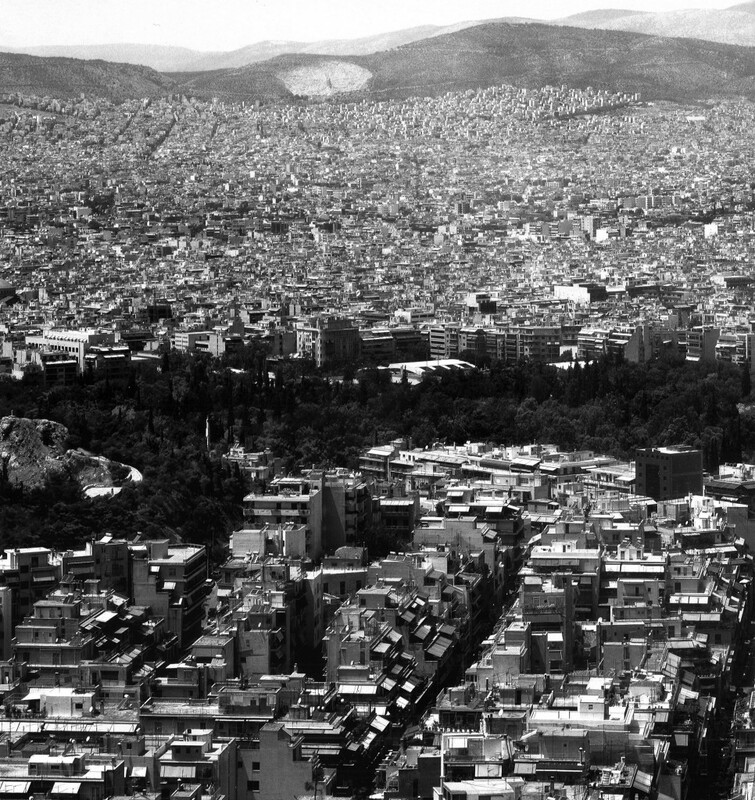 In the case of Athens, the result of the above is a rather continuous urban horizon, where the monad, the pixel of the city prevails. This homogeneous space of urbanization spreads throughout the landscape, overcoming occasionally the historic, physical and administrative boundaries of the city. The research investigates a specific Historic period, all along which the Modern Greek cities were formed and developed with an unprecedented fashion, while it also attempts to establish a genealogy of this project since the very foundation of the Modern Greek State in the mi-19th century. The thesis focuses on the last sixty years of urban development in Athens, when the city acquired a paradigmatic role in the post-WW II reconstruction policies deployed in the country. Along this period, fundamental elements of the regulatory framework and the political/ideological mechanisms reached their higher sophistication. The thesis aims to problematize the structure of the contemporary Greek city, especially within this era of economic and social collapse.